TotallyYourType: A stunning script typeface... on a Standard! A stunning script typeface... on a Standard! 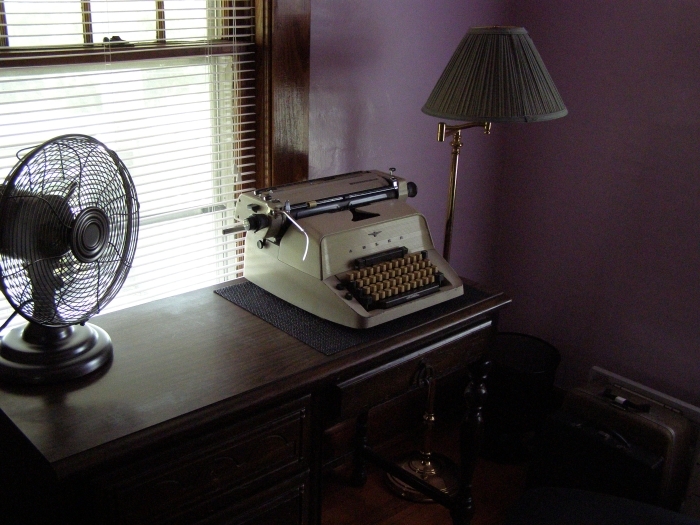 This is big typewriter, and it looks awesome on my little desk. All work and no play makes Jack a dull boy... This is a slightly intimidating machine to sit behind. It is easily my tallest. Amazing find! These giant Adlers seem to be quite similar to the Olympia SG1 and SG3. If it types anything like them, I can understand why you love it so much! My first script typer was a great eBay score as well. Now that I have one, I really have no interest in another. It is very similar to the SGs. It has the removable carriage and everything. I think Adler copied Olympia. There must have been a deal or something. very cool! its a beaut! Cool, and what a great bargain! I have yet to get a big Adler but hear that they are excellent. That's a good looking machine. Sounds like you have a severe deficit with Adlers, no big Adler, no Tippa... You're collection is amazing and fantastic but there needs to be some more Adler representation in there! I'm wondering what was this typewriter used for, did you ask the seller? I never thought to. I wish I did now. I can't imagine what it was used for. So very Teutonic, Adlers. I like the looks of them and the feel on the few standards I've typed on is less mushy (and therefore better, imho) than Olympia SGs. Bill at MTE has a big grey metal one in his "to someday fix and sell" pile with an oversized carriage and a really neat director-style typeface that I really like, but I need a big standard like I need a hole in the noggin. Standards with script are pretty rare! This is a serious indulgence by the original purchaser. I do recall seeing a script Royal FP on here someways back. I'm just not sure where. That's a find and a half... beautiful. I do rather like the look of the universal - They're so brutally determined to look utilitarian and purposeful. Speaking of universals.... Isn't this the same model of Adler that is was a character of its own in the film 'The Shining'? All work and no Script, makes typefaces a dull subject. sweet deal. I find the script machines come to me very lightly used. That's a big hummer all right. I would have been put off by the shipping cost. $30 shipping is not much more than what it usually costs to ship a standard. I've only had two standards shipped and the other cost $60 shipping! Both were well worth it though. Awesome beast! At some point I will have to find out how much easier a standard is compared to a portable. The cursive typeface is a bonus. You are lucky others didn't check the photos closely enough. Nice score. And I agree, the cursive typeface is such a bonus, looks really good. I had a similar surprise with my cursive Hermes Media 3. Once in a great while, the stars align. p.s. I've added you to my Typosphere roll. Thanks a bunch. Let me see if I can add you. I use the typosphere one to keep up with everyone, but I don't mind filling mine out and it's always good to be on others. What a wonderful typewriter - I do not have any script machines in my collection. For some odd reason I have avoided them in the past, and I can't think for the life of me why that would be. The packing sounded like a nightmare - but at least it survived. I am very wary of ebay packers, and sometimes ask them up-front how they intend to pack - especially if they are the sort to have aggressive "bad payers will be reported" stuff in their listing (in my opinion bad packers are far worse than bad payers). I've got the Adler Universal from 1955 - what a beautiful beast! Unfortunately it wont advance when you strike a key, but other wise everything is free, and moves. I can type and advance it manually which is a pain, but the typeface is I believe "Congress" and is very nice. 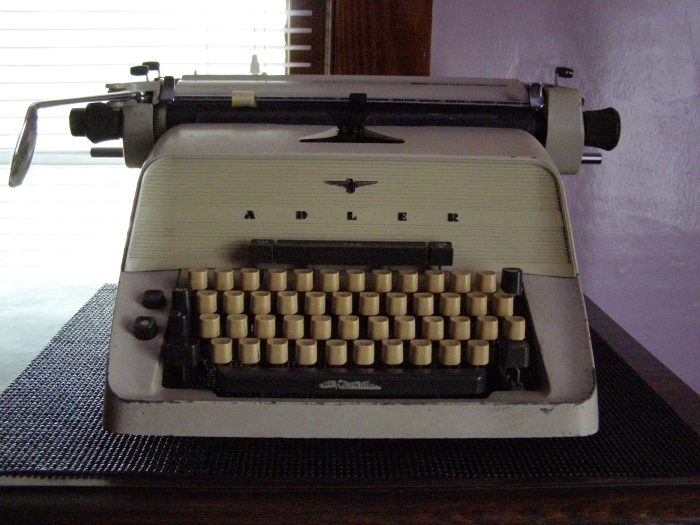 Maybe Adler made specialty type typewriters. Anyway, love yours, and mine would be my favorite if it worked. Do you know why it will not advance? I don't know why it won't advance. I've had it apart twice, and it's been to a repairman who also can't see what's wrong. Although my repairman is a younger guy who mostly does copiers etc, and typewriters on the side. I probably need a good old fashioned typewriter guy who knows them in his sleep, but the old guy in Chicago (the last) died a year ago, and his old time shop is closed, unfortunately. Rob Bowker suggested that I have someone who has one take pictures of the interior, and especially the escapement area - to see if something like a spring is missing, or a part bent. The only one I know about is you, even though you've got the next model from mine, I don't imagine the mechanism changed much between two consecutive models!!?? I know that you're working now, but........ and there's no hurry. If it's too much trouble, I understand, or if you know someone else who has a 1955 Universal, that would maybe be better. Anyway, let me know. 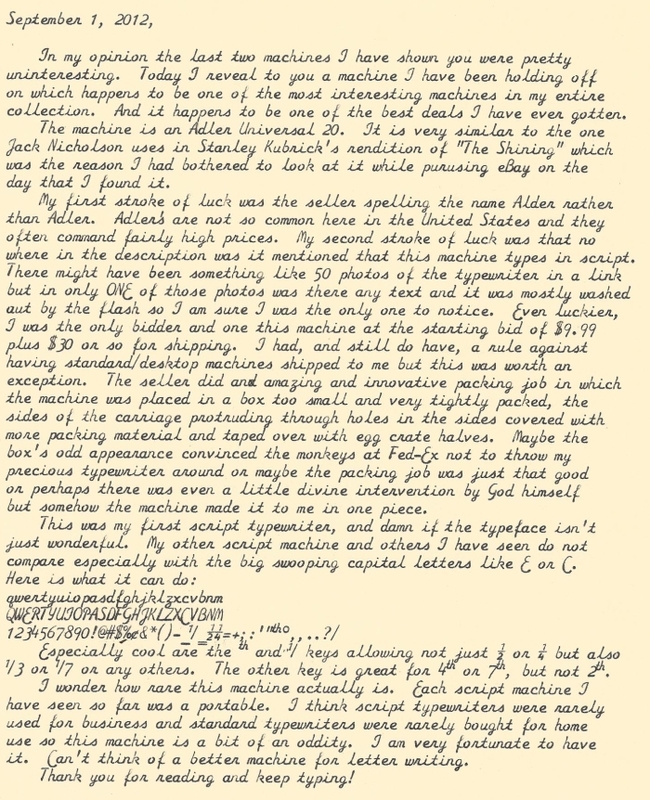 Richard Polt has an earlier Universal, and there are at least two others on the typewriter database. I can add more photos to that once I am home if I have the time, and if I do not in the next few days remind me please. Hey, I think it's okay. I called Bill Wahl at Mesa Typewriter Exchange in AZ, and he walked me through what to do. Basically it came down to taking it outside in the fresh air and flooding it with Lacquer thinner (I used Xylol) or a good degreasing agent till the mechanism is clean. Then work/move the escapement wheel till it's free. I did get it freed up, and after a good airing out (Highly fumey toxic chemicals) I'll spray silicon it, and it should be good as new! So, thanks for your willingness, and hurrah for the Adler "big boys"
I did just add a few pictures. Hopefully that attempt will work for you though (it should). These are good machine to type with!